Dr. Hamed Sattar did his graduation from the Institute of Chemical Engineering and Technology (ICET) in 2002 and joined the Institute as Lecturer (on contract basis) in the same year. 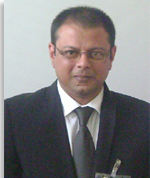 Currently he is working as Assistant Professor at ICET. He completed his MSc in 2006 from the same institute and then obtained his PhD degree from the University of Leeds in 2013. He did his research work on combustion of coal and agricultural waste biomass. He has published more than 20 research articles in journals of international repute. His research work has been published in more than 20 international conference proceedings.